This episode of Investing in Real Estate is sponsored by Betterment. Betterment is the largest independent online financial advisor. Their service is designed to help improve customers’ long-term returns and lower taxes for retirement planning, building wealth, and other financial goals. Investing in Real Estate listeners can get up to one year managed free. For more information, visit betterment.com/clayton. In this series, Natali and I have discussed our biggest real estate mistakes and downfalls. Unfortunately, the story doesn’t get better from there. We both lost jobs, questioned our worth, and eventually had to dig ourselves out from debt, bad credit, and limiting beliefs. 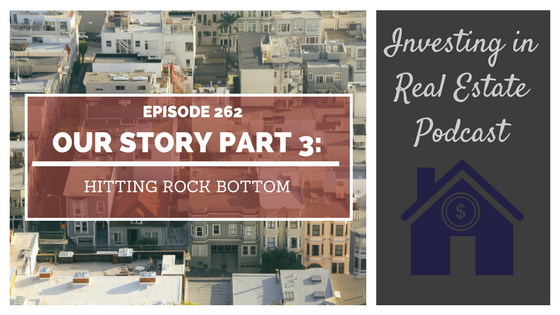 On this episode of Investing in Real Estate, we are sharing more of our family’s history—including how we hit rock bottom, financially. We’ll talk about losing our jobs, and how we finally decided to start implementing change and living life on our own terms. You’ll learn about the resources that helped us, and the major paradigm shifts that occurred. Please join us for another installment of our story! As we discussed in part one and part two, Natali and I faced some serious hurdles before our real estate careers took off. After we got married, we believed the traditional advice about wealth building: that we should work for a paycheck, put some money aside in a 401k, and eventually retire. But after I was let go from a broadcasting job in Philadelphia, my mentality started to change. I promised myself that I would never let an employer dictate my future or determine my worth ever again. Even though I did jump into another paycheck job, I started researching in-depth how to take control of my future and finances. Because I worked weekends at FOX, I was able to spend the rest of the week learning about entrepreneurship and wealth creation. I spent hours upon hours reading books, listening to podcasts, and implementing ideas. Shortly after we had our first child, Natali lost her job. She felt that same pain that I had experienced years before. When she tried to find something else that would fit our family’s schedule, it just didn’t work out. She wanted to work part-time, and nothing seemed right. She decided that if she couldn’t bring in income, that she would learn more about personal finance and how to be a better steward of the money we did have. Simultaneously, we went on a learning journey. As I looked into investing strategies and entrepreneurial pursuits, Natali realistically surveyed how to implement them. At this point, we hadn’t yet pursued real estate, but the wheels about wealth building had started to turn. On today’s show, we’ll share more about hitting rock bottom—including the huge paradigm shifts we experienced during this time. We’ll talk about the importance of self-education, and how Rich Dad Poor Dad changed our perspectives. Don’t miss episode 262 of Investing in Real Estate! What is the importance of having a working balance sheet? How should you attack your balance sheet? What books did we read during this time? Why is it so hard to create wealth in the stock market?